On the top of mount Gogjeh Dagh in Torkman Sahra, Golestan Province, Iran, there are three tombs which is believed to belong to prophet Khaled (Khaled Nabi) on the highest mount in the region, 700m above sea level, along with his father in law (Aalam Baba) and his shepherd (Choopan Baba) on lower adjacent hills. 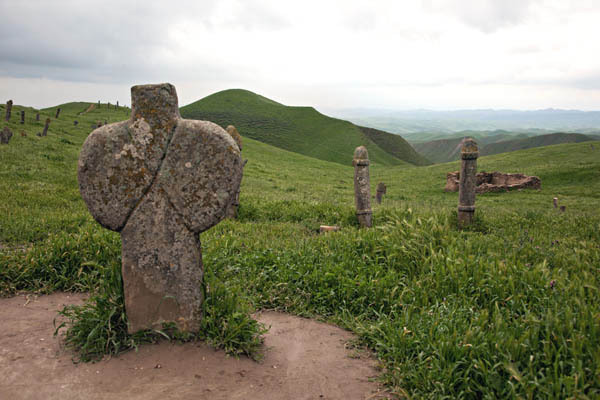 Close to the tombs, there is an ancient Mysterious Cemetery with about 500 strange and unusual gravestones, with shapes of human genital organs, representing buried person's gender. There is no comprehensive study about the origin, date or religion of the people buried there; some believe they belong to people with phallicism ideas, migrated from India or central Asia, as there is no evidence for such believes among local people through history. -	Cylinders with Ram head, as sign of fertility, power, sovereignty and respect. Whatever these stones are and resemble, they are mystic, beautiful and part of human heritage. They area an interesting find Ali. At first I thought how nice that they weren't confined to a fenced area. I'll be interested in your future postings. Nice image. well done Ali. A great photo, I do enjoy the information you provide, a great country with a real history. Beautifully captured and very interesting place and story. Look forward to more! V.
A great composition. Well done. Super composition. This image really is intriguing. After reading the story about the place, I look forward to seeing your new gallery.